Twenty four year old Patrick Ivison was hit by a car as a small child when a distracted driver backed up suddenly and ran him over. He suffered a C4-C5 incomplete spinal cord injury. Patrick has been an advocate for the laws requiring back up cameras in all cars and testified in Washington DC . Patrick recently graduated from the USC School of Cinematic Arts. Patrick received a lifechanging scholarship from Swim With Mike to attend his dream school. Since graduation Patrick has been living in Los Angeles,CA and working on numerous film projects, doing sound design, and is currently working in post production. 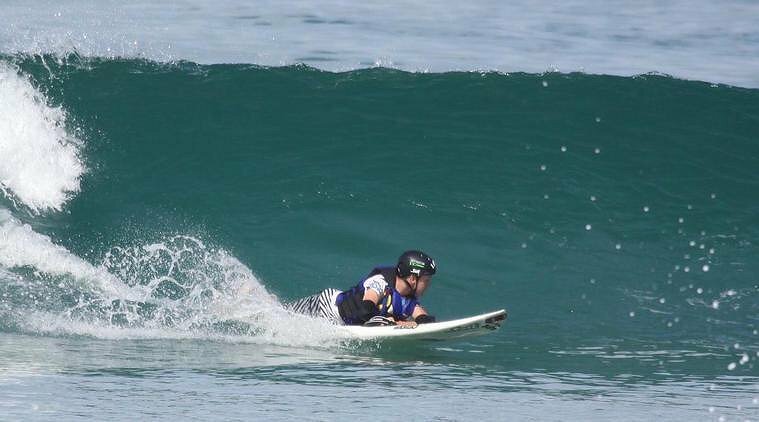 In his free time Patrick surfs using an adaptive surfboard and plays wheelchair rugby. Below find the video that Patrick submitted for his USC School of Cinematic arts application. 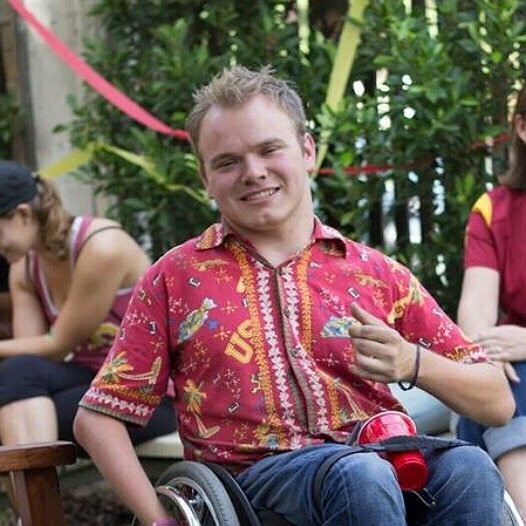 Patrick and his family are raising money to cover the costs of repairs to his wheelchair accessible vehicle and for the cost of a caregiver so that he can live independently while working in Los Angeles. Thank you so much for supporting Patrick!!! We feel so incredibly blessed by your generosity. Patrick and his family have chosen to fundraise with Help Hope Live in part because Help Hope Live provides both tax-deductibility to the full extent allowed by law and fiscal accountability to his contributors. Contributors can be sure that funds contributed will be used only to pay or reimburse medically-related expenses. To make a credit card contribution to Patrick’s fundraising campaign, call Help Hope Live at 800.642.8399 or click the DONATE NOW button. Patrick is living in North Hollywood and working long hours in Los Angeles in post production. He has a wonderful girlfriend named Kimberlee. He’s been working out in his gym at his apartment complex, playing rugby and occasionally surfing. He continues to be active in the movie making business. He recently shared his story in a movie called Take a Look At This Heart. He helped pass the laws that require all new vehicles to have back up cameras. He recently participated in a film challenge contest and his movie was nominated for best writer. Patrick is doing great! He graduated from USC school of Cinematic Arts last year and he is living in North Hollywood working at a company called Audio Eyes. He does sound design and mixing for them. Here is the incredible video from the Today Show of Patrick WALKING at his high school graduation. Patrick, you are an amazing man with a great future ahead of you- you have inspired me throughout the yrs as i met you when you were five. I love your whole family (even Derek!) and i too cant wait to see your name on the big screen! Never never never give up! You are awesome!!! Patrick, You continue to inspire us in so many ways. You are truly amazing and we can't wait to see your name on the big screen. I'll even stick around for the credits for once. ;) Love you so much, dude!!! Patrick, I am a friend of your mom's from high school. I have been following your story on her FB posts. You are an incredible young man and have an amazing life ahead of you!! All the best to you and your family! Patrick, I found your story through utube video of you and Ricochete and then searched on and read your amazing story. I truely believe you shall walk again. Keep up the good work. Patrick, I wish you all the best with all of your goals. I am inspired by your positive attitude, energy and determination (as well as your adventurous spirit!) Take Care. Patrick: I am remarkably touched by your story and it kills me to hear what happened to you. And, I love that you are still fighting to walk again. When I was 20 years old (almost 21 yrs), I was in a traumatic car accident and, luckily, I was still on my father's excellent government health insurance policy. I fell asleep at the wheel and woke-up a month later to discover I was paralyzed on the entire left side of my body, shattered ribs, bla bla bla ... I had great medical care and was able to overcome being paralyzed. I am no doctor, but, I do believe one's recovery is based on medical coverage, love & support, God and your "will" to recover. I am now 38, and I walk fine. But, for the past 17 years, I've always had a strong desire to help someone who doesn't have adequate insurance. At this time, I can only contribute a small amount. But, I am due significant monies based on another traumatic incident (personal injury) that happened to me in NYC. I can't talk about it, but, I expect a huge settlement due to the careless acts of other people (as is the case with you). I don't want to get your hopes up high, since life is full of surprises, but, I pray that I will be able to contribute much more in the future. I also want to put your story on my personal website. I am someone who only wants to help. I know where you are and I feel your positive energy. Please stay strong and determined! Patrick, You are an inspiration to all! And I just fell in love with Ricochet! What a doll. I also am an avid animal lover. Never give up, no matter what they tell you. You have a terrific Mom,always listen to her and you cannot go wrong. I hope my donation will help in some way. God Bless and Keep you and your family and wonderful circle of friends and animals. Patrick, You are an amazing young man! Your will and determination to succeed is very inspirational. We are donitating to help you and wish you and your family all the best. God bless you. Patrick, your story touched my heart. You are an amazing person. I recently had a nerve injury that has affected my walking, and you give me hope that I will fully recover. Keep up the hard work. Hope my small contribution made to your fund will help with expenses.